A stunning yellow and white toned water resistant timepiece with a unique rectangular dial that gives it a classy look. 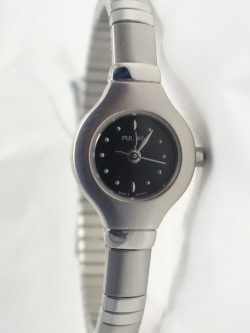 The stainless steel bracelet can be adjusted to fit any wrist. Lorus guarantees the movement for 3 years. All prices are in Canadian dollars. The elegance of a small blue dial brings a vintage look to a modern watch. Its expansion bracelet makes it easy to put on and take off. Its simple and delicate nature makes it look more like a bracelet. All prices are in Canadian dollars. 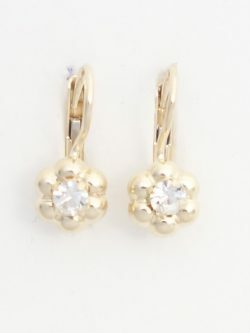 Adorable 14k yellow gold flower earrings were made in Italy and make a great gift for a baby girl or adult woman. 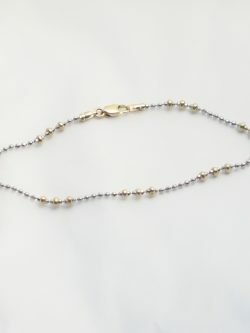 The white stones stand out but can be worn with any outfit. They have a lever back closure that make them easy to put on and take off. 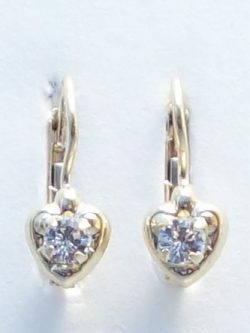 Length of Earrings: 16mm* Length of Flowers: 7mm* Width of Flowers: 7 mm* *all measurements are approximations.